This trip offers the perfect balance between wildlife safaris and beach bliss. Begin amid the colorful streets of Cape Town, discovering its rich heritage and delightful landscape. 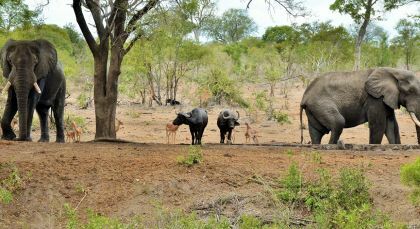 Kruger offers the quintessential African safari with a concentration of large mammals including the big five. 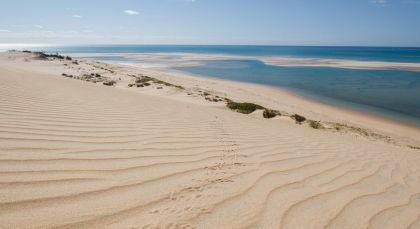 End your African vacation on the idyllic beaches of Mozambique, surfing, snorkeling and sailing to your heart’s content. Discover the breathtaking beauty of the Cape Peninsula and Cape of Good Hope. The tour starts at 8:30am and takes around 9 hours. Highlights of the tour include Boulder’s Beach where you can observe penguins, the stunningly beautiful Cape Point Nature Reserve, Hout Bay Harbour and the enchanting Kirstenbosch Botanical Gardens. Explore cosmopolitan Cape Town on this half day tour which starts at 8:30am or 1:15pm and takes around 4.5 hours. 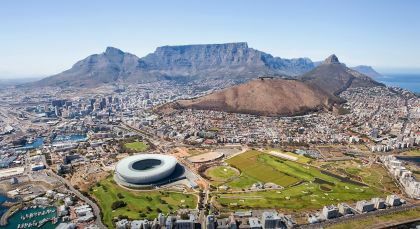 Highlights of the tour include the Castle of Good Hope, Green Market Square, Company Gardens and of course – weather permitting – a visit to the top of Table Mountain which offers breathtaking views of Cape Town and the surrounding coastline (please, note that Cable Car Fees are not included). Take a leisurely walk along the streets of Stellenbosch. On this walk, enjoy sampling the delicious flavors of South African cuisine. Select from top quality, locally produced food. Also get to meet and interact with food artists, getting insightful stories of what inspires their passion for food art. Take a stroll from one tasting shop to the next, getting a taste of platters of seasonal local products, freshly baked bread, snacks, homemade ice-cream, melt-in-the-mouth pastries and confectionery. The guide will take you on a tour around the oak-lined streets of the old town center. Explore and soak up the beauty of the charming town taking in the amazing architectural marvels of the centuries old town. End the tour with a special tasting of some of the delicious regional wines. Kruger National Park is the epitome of safari experience in Africa, rich with its lion prides, elephant herds and thousands of other animals, against shifting backdrops of savanna, forests, rivers and mountains. Search for the Big Five and experience wonderful game drives in the early morning when the animals are particularly active and in the late afternoon when the sun paints incredible colors on the horizon. You can also experience exciting night drives to observe rarely spotted nocturnal wildlife. Search for the Big Five and experience wonderful game drives in the early morning when the animals are particularly active and in the late afternoon when the sun paints incredible colors on the horizon. You can also experience exciting night drives to observe rarely spotted nocturnal wildlife. Stretch your legs and enjoy exciting bush walks with an experienced guide to discover the small wonders of nature. The Bazaruto Archipelago consists of five untouched and idyllic dune islands, strung out in the Indian Ocean’s turquoise waters and ringed by fine white-sandy beaches. Stay at a nearly untouched paradise on earth and enjoy marine activities in one of the most beautiful destinations in Africa. The sight that awaits you is unparallelled in its beauty with white sandy beaches and the crystal clear waters of the Indian Ocean as far as the eyes can see. Paddle on these waters in a kayak and witness the vibrant marine life below and the gorgeous coral reef. Our sunset dhow cruise provides the ultimate relaxation as you enjoy the pristine surroundings of the Bazaruto archipelago. As you cruise in the wooden sailing vessel, catch the sunset in the horizon—an experience you will not forget soon. Accommodation in one double room for 12 days / 11 nights. South Africa: Game drives in high quality and well maintained safari vehicle with professional English-speaking driver guide. Game drives may be shared with other guests of the lodge/camp, with maximum of 9 guests in the vehicle.